We are not stuffy, rigid or trapped in the past. We’re friendly, progressive and creative, reflecting a cross-section of our community. We are a community of faith and we extend a warm welcome to everyone. Each person, each creature and each part of creation is sacred, deserving of respect, honour and the eternal embrace of God’s love. We strive be a safe community, growing together in faith as we seek God’s presence in our lives. We don’t claim to have all the answers. We try to be non-judgmental and inclusive as we explore issues of faith and its relevance in our daily lives as individuals, and as a community. People sometimes tell us our church is difficult to find in the maze of Peel Village. Many visitors profess that they didn’t know we were here. Admittedly, we seem to be tucked away in a corner. But the venture is worth it. 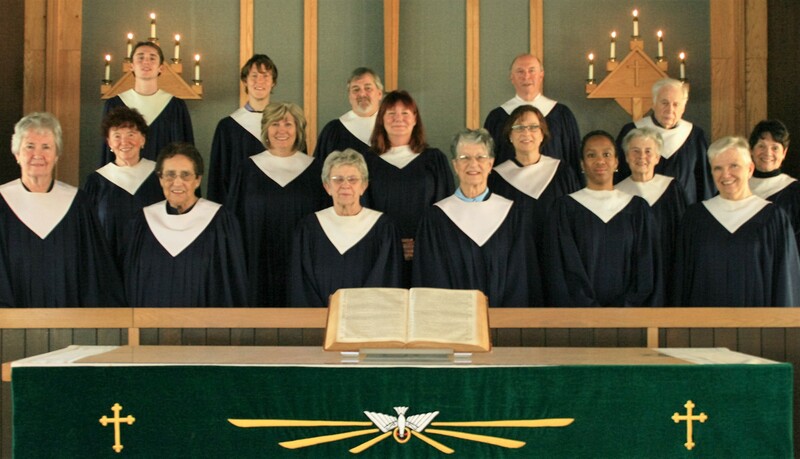 We are a Christian community of faith growing spiritually by serving others and creation through meaningful worship and music accompanied by compassionate, thoughtful care and outreach. To be a people of God sharing our faith, enabling and encouraging others to build God-centered, compassionate relationships. To be a community of faith serving as a beacon of hope and possibility to local and global communities. We believe that all people and the world around us are sacred gifts of our loving God. We all have gifts to discover and nurture; to share and to receive. Therefore, we endeavour to live out Christ-like relationships that are inviting, respectful, compassionate and authentic. We are not alone, we live in God’s world. who works in us and others by the Spirit. We are not alone. Thanks be to God. St. Bartholomew’s began in 1956 when the two old established churches, St Paul’s and Grace, considered that the first subdivision in Brampton known as Rice or Eldomar Heights was developing to an extent that a third United Church could possibly be required. In 1958 two university students, one of them Eleanor Moreithi, through Home Missions carried out a survey in the Rice subdivision. There were 115 families who expressed interest. One of the students was William Ferrier who would eventually become the first student minister of St. Bartholomew’s. In April of 1958, Presbytery appointed Rev. Fred Balsdon, minister of Trinity United Church in Malton, as supervising Minister. On May 25, 1958 the first public meeting was held. It was chaired by Rev. Fred and at the meeting it was resolved that on Sunday, June 8, 1958 the first church service would be held at Gordon Graydon Public School which is now known as St. Mary’s Separate School. Forty-six people attended the service. Colonel Bartley Bull was a member of Grace United Church and had first-hand information on the new church. He offered Presbytery a two-acre tract of land for this new church. This land was south of the last house on Abbey Road and extended to the west. Presbytery purchased a temporary building from the Malton Compensation Hospital for $650. It was moved to the new property at a cost of $2600. There were no buildings to the south, east or west of this area at that time. The Charter Roll was opened on July 13, 1958 and closed on October 5, 1958. There were 115 names on the roll comprised of 41 from St. Paul’s, 23 from Grace, 25 from other churches and 26 by profession of faith. The first service in the temporary building was held on January 18, 1959. Rev. Fred was inducted as minister in September of 1959. Colonel Bull voiced a desire to have an organ installed in his name in the new church. The organ cost between $22,000 and $24,000 and was dedicated on May 27, 1962. Unfortunately, Colonel Bull died prior to this time and so he never witnessed the new organ. In his will he left more than $70,000 to the church and as a result we were able to build the Christian Education wing which bears his name on the corner stone. The church itself cost between $108,000 and $110,000. There were three phases of construction: a) Church Sanctuary, b) Christian Education wing, c) Main entrance to the church through the temporary wall at the rear of the church (never completed). Cornerstone laid March 4, 1962. General contractor building the new church was Hartzes & Son Construction. Colonel Bull died in 1962. The United Church Women was formed in 1962 with Mrs. Fred Balsdon as Provincial Chairperson. In October of 2003, we celebrated our 45th anniversary. On this occasion the Rev. Eleanor Moreithi, Minister Emeritus, conducted our service. Eleanor was one of the student ministers through Home Missions that canvassed Rice subdivision in 1958 to survey if there was a need for our church. On the occasion of our 45th anniversary we dedicated new stained-glass doors leading into the sanctuary to welcome worshippers. These doors were in honour of the founders, builders and supporters of our church. In our first 50 years we have grown closer to the God who created us and closer together as a Congregation in the United Church of Canada. From 1958 to the present time, we have had twelve ministers.